CUYAHOGA FALLS — Make friends. Use humor. Ignore. Agree. Stand up. Walk away. 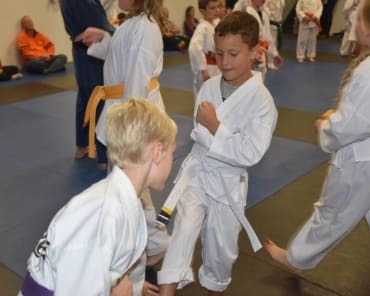 These are six of the 12 steps to busting bullies, as taught by local karate teacher Matt Zahand. Zahand said he started his Bully Buster program two years ago when he returned from serving in the Navy and found that students in their teens and younger were committing suicide at an alarming rate. This is his third year presenting the program in local schools. 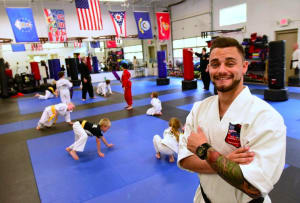 Zahand, 23, has no children of his own, but as an instructor at his father’s martial arts school on Akron Peninsula Road, he comes in contact with young people nearly every day. The news of children harming themselves hit him hard. “I heard about all these kids committing suicide and it just baffled me,” he said. “I mean, literally 8- and 10-year-olds doing this kind of stuff.” Zahand said he returned home from the Navy because had broken his back. As he was trying to adjust to civilian life again, he began to hear about a rash of suicides in area schools, primarily in Perry Township. 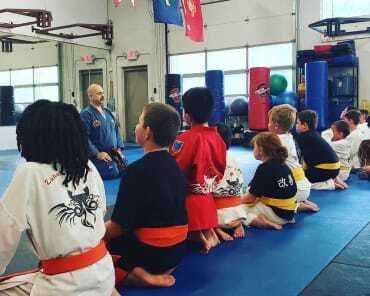 “Sensei Matt,” as he is known to his students, said the program aims to educate children and teens on how to handle themselves in bullying situations and to understand there’s nothing wrong with getting help. Zahand said he based Bully Buster on a similar program attributed to a Dr. Webster 20 years ago. An “old-timey” program in his eyes, he said, he took it and modernized it. When a principal invites him to give his program, Zahand takes over the school’s gym class for a day in elementary schools and two days in middle schools and high schools. He said he’s already had a background check done on himself for the benefit of the schools he visits. Wilson said improvements have been seen in student attendance, self-esteem and overall demeanor. Zahand said the program in the middle and high schools is different from the elementary school program because it’s two days and the students are a little older. 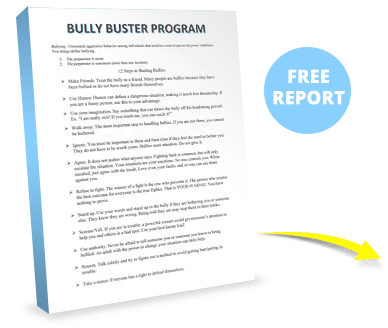 Bully Buster has been presented in most of the Cuyahoga Falls City schools, Zahand said, including Lincoln, Richardson, Bolich, Roberts, Preston and Price. Zahand is planning to return to those schools with his program again this school year, possibly adding DeWitt and maybe Silver Lake, too, if possible. Richardson School’s gym teacher, Stephanie Petit, said the program teaches kids they have a voice and it gives them a non-violent way out of a situation. Petit said he also teaches in some cases agreeing with the bully can diffuse a situation. “Don’t argue,” she said, adding the bullying victim is not always the only one in need of help. The bully may be hurting and in need of a friend, she said. Zahand said he volunteers his time to put on these programs, with no charge to schools located within a 15-mile radius. Typically he contacts a school district’s superintendent to see if there is an interest. If the superintendent gives him the go-ahead, Zahand contacts the building principals, or they contact him. Zahand acknowledged he doesn’t make any money doing the Bully Buster program. Very few children who see his program sign up for classes at his family’s school, he added, and the programs take away from his time teaching at the school where he earns a living. “It cuts into my day a bit, because I could be down at my facility making money, but that’s not really point,” he said. “The point is to help these kids because they need it.” If anyone signs up for a class, Zahand gives back a third of a month’s tuition to the school. 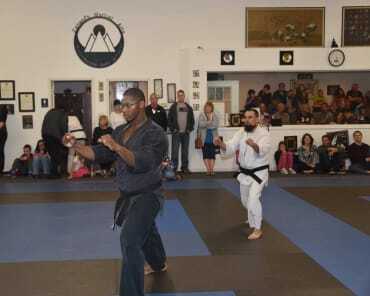 For more information, call Zahand’s Martial Arts at 330-926-2001.